Germany's centre-left SPD party has said there would be no quick deal on government in the EU's bastion of "stability". "We first need to look at what the possibilities are, but no one can expect it to go quickly," SPD foreign minister Sigmar Gabriel told the ZDF broadcaster on Thursday (30 November). "The conservatives, Greens, and FDP took months to get nothing off ground, so I'd ask people not to put pressure on us," he said. No one should expect the SPD to make an easy bargain "only to keep a few jobs in government", he added. His remarks were among the few clues to what happened when SPD head Martin Schulz, chancellor Angela Merkel from the centre-right CDU party, and Horst Seehofer from her sister party, the CSU, met for initial talks in Berlin earlier the same day. 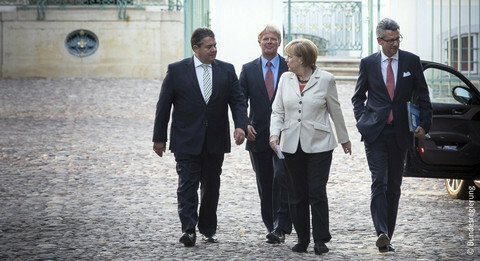 The party leaders left the Schloss Bellevue, the presidential palace, after 135 minutes of discussions without speaking to press. 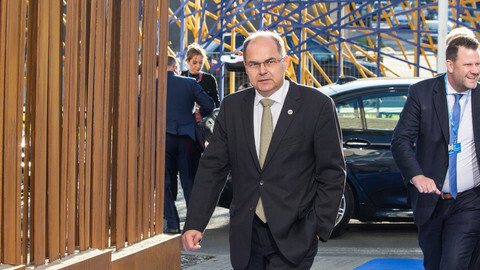 Stephan Weil, an SPD deputy, had earlier said not to expect a deal before February. 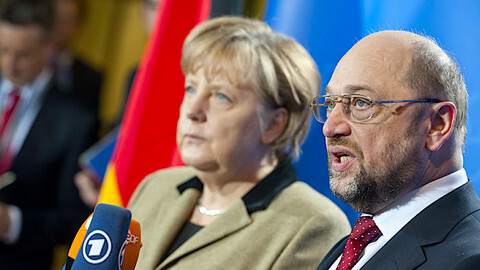 Johannes Kahrs, an SPD member of parliament, told Deutschlandfunk radio on Friday morning that Schulz and Merkel were far apart on European integration and on social welfare. "We will discuss what the key issues are for us, what substance we want," he said. 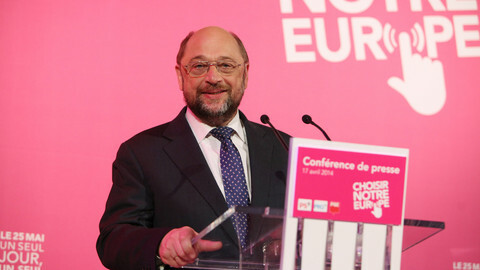 Schulz had earlier called for a single eurozone budget and finance minister and an EU-level minimum wage. He had also called for expensive health care and pension reforms in Germany. SPD leaders will hold internal talks on Friday at the Willy-Brandt-Haus, the party's HQ, in Berlin, prior to a full party congress on 7 December. But Peter Altmaier, Merkel's finance minister and right-hand man, responded to the SPD's wariness by saying Germany needed to act swiftly to maintain faith in its stability. 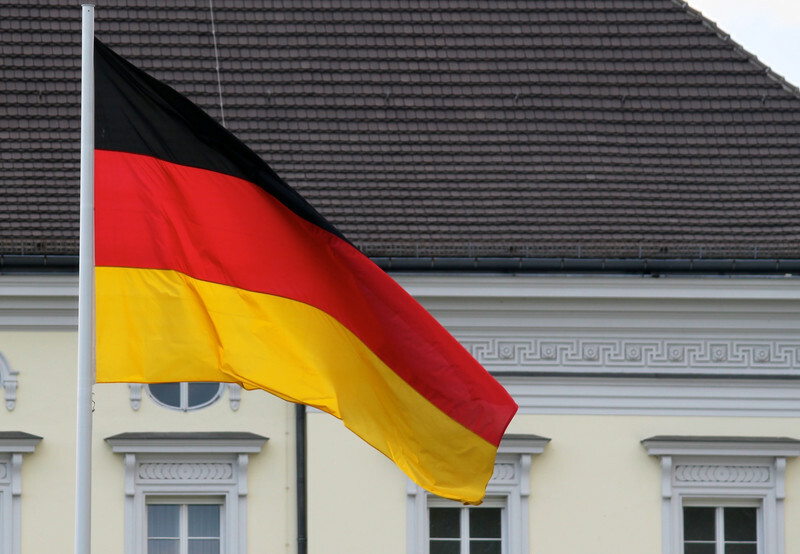 "We're making the case for that because we think one of our trademarks, alongside 'Made in Germany', is 'Stability Made in Germany'," he told ZDF on Thursday. 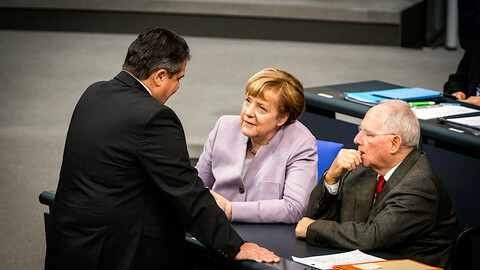 Altmaier added that German people expected the two sides to make a deal. "Everyone has to live up to that," he said. 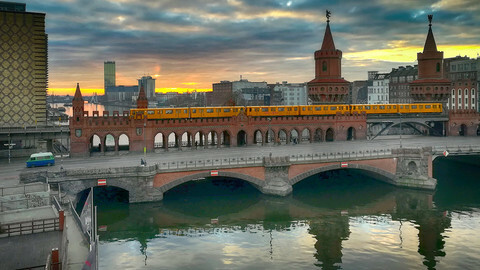 A survey out on Friday by pollster Allensbach said 61 percent of Germans and 58 percent of SPD voters wanted the SPD and CDU/CSU to start formal coalition negotiations. Another survey, by Forsa, said 40 percent of Germans and 36 percent of SPD members wanted them to join up. 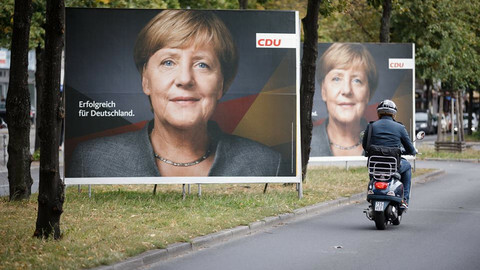 Merkel's CDU/CSU party won 246 seats in the Bundestag in elections in September. 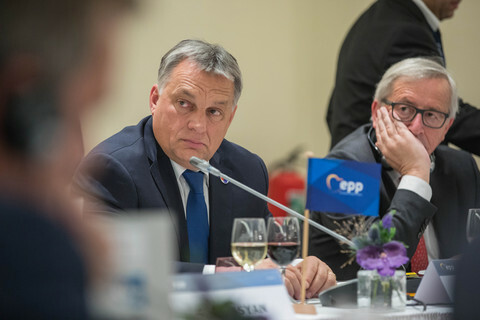 But earlier talks with the Greens and the liberal FDP party unravelled, forcing her either to make a deal with the SDP, to rule in a minority government with the Greens, or to trigger new elections. The SDP won just 153 seats, its worst result in post-WW2 history, following the past four years of joint rule with Merkel. 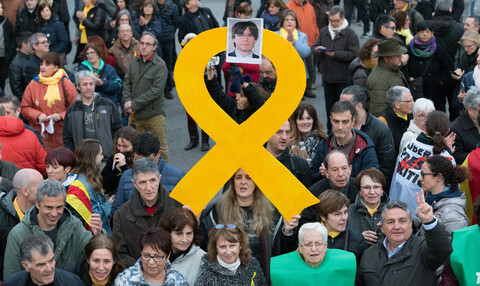 It had earlier vowed to go into opposition, while Merkel had said she would prefer new elections, but both made a U-turn after an appeal by the German president. "Only if this attempt [a new SPD coalition] fails do we need to think about other steps - not now," Thomas de Maiziere, the CDU interior minister, told the Frankfurter Allgemeine newspaper.